Write up a contract to develop a project for a client with this customizable Graphic Design Project Agreement template. This is a generic legal agreement which is not country-specific and can be used anywhere. Any changes to the specifications must be by change order and will constitute additional work and incur additional fees. The designer will work up preliminary design sketches at the outset of the project, and will present proofs for the client's approval at each stage of the project development. The template contains alternate clauses covering the client's reproduction rights to the project, depending on whether the client will have unlimited or restricted rights. The designer retains ownership of all original artwork designed for the project. The designer warrants that the project will conform to the specifications, and the designer's liability is limited to adjusting the project to make sure it conforms. The client warrants that all materials it supplies to the designer are owned by or licensed to the client. The template includes a Contract Change Order form. This legal contract clearly defines each party's obligations, and protects your rights to your original work. Get the Graphic Design Project Agreement template and use it for all of your projects. USA web developers, write your customer contracts with this comprehensive Website Development Agreement template. This USA Website Development Agreement is provided in MS Word format, and is totally editable to meet your exact needs. 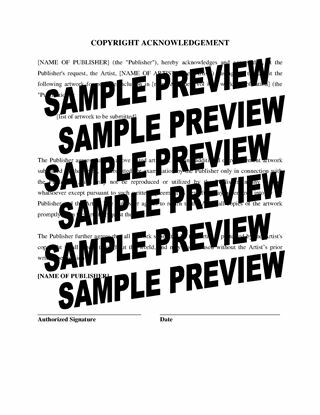 When original art or photos for publication, protect your copyright in the work by having the publisher or editor sign this Acknowledgement of Copyright in Artwork at the time you submit the work. The publisher / editor acknowledges that you are the owner of the copyright. The publisher / editor agrees that the work will not be used for any purpose other than for the publication. Don't run the risk of losing your rights in your own work. Always get the Acknowledgement of Copyright in Artwork signed when you submit original art to any person, firm or website. 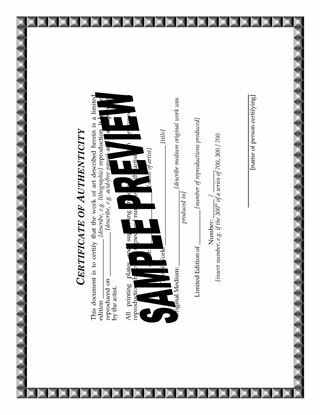 Prepare a Certificate of Authenticity for a limited edition art work with this ready-made template. The Certificate can be attached to each copy in a limited edition series of artwork. Each reproduction produced from the original must be certified as authentic and numbered as part of the series, for example, in a series of 200, the limited edition reproductions are sequentially numbered 1/200, 2/200, 3/200, and so on. The Certificate also certifies that the plates or other materials used to make the reproductions have been destroyed, and that each of the pieces is signed by the artist. This Certificate of Authenticity of Limited Edition Work template is available in MS Word format and can be printed out and filled in by hand, or completed on your computer. If you need to move forward with certain aspects of a transaction, such as financing, before the deal is finalized, you can put a letter of intent in place. Write one up with this template for use in the U.S.
A letter of intent is not a legal contract, except for specific clauses such as the confidentiality provisions. The LOI summarizes the terms that have been negotiated and indicates the parties' intention to finalize the transaction. This provides a level of security to lenders or investors who are funding the deal. The parties agree to negotiate exclusively with each other and not consider or accept any other offers while the letter of intent is in effect. To download the USA Letter of Intent, purchase the form by checking out over our secure payment server. Hire an outside consultant to provide services to your business with this downloadable Consulting Services Agreement. This is a generic (not country specific) legal contract in letter format. The consultant will provide the services on an ongoing basis for as long as the client requires them, or until the contract is terminated. The consultant will be retained as an independent contractor, not hired as an employee. The contract is not exclusive for either party. The consultant will make him/herself reasonably available to provide the services to the client. Services will be delivered in a timely manner. Procedure for consultant's invoicing and payment of fees and expenses by the client. The ownership of the consultant's work product will remain solely with the client. Confidentiality provisions to protect the client's proprietary information. The consultant agrees not to solicit any of the client's employees. This Consulting Services Agreement template is fully editable and can be easily customized for your circumstances.